The last thing anyone would want is to vent away from the outside world, infused with colossal amounts of pollutants; and be pestered with the same issues when back home. Our homes are our places of sanctity, the one where we need time and a peace of mind to heave away the pressures and get a positive outlook on the way things are turning out to be. While the uncontrollable amounts of rise in the pollutants in the atmospheric air are turning out to be a nuisance in the daily lives, it isn’t at the same time being possible to keep it under control. During times like these, there are those sections of people who have a hard time facing these pollution issues due to their long time physical problems. For these people and everyone who all the time has only wanted for a fresh breathe of air, air purifiers are certainly a boon. When it comes to home air purifiers, a lot has been said and done, and nothing has actually stood up to the expectations of consumers, fairly due to the fact that their idea of air purifying was pretty bleak. In times when there are possibly over a hundred of air purifier manufacturers readily available in the market at any given point of time, very few of them actually stand up to the rigorous tests of the pollutants in air. While there are hundreds of home air purifiers out there, Clair has efficiently managed to get the jest of how air purification should actually be. The latest offering –Clair is a device that has taken home air purification to an altogether height thanks to their innovative patented technology and great design sense. For those who have little or no clue regarding how air filters work, most of the air purifiers out in the market right now make use of the HEPA filter. The air purifiers using this technology were bogged down with heavy monthly electricity bills, noticeably intrusive loud noises and moreover were chunky and bland in their outlook on design. Enter Clair, and all your homeair pollution problems will be long gone. Clair is making use of an in-house developed and patented technology for air purification – e2f filter. Most of the air purifiers fail to filter away miniscule pollutants, fairly of the order of 0.3µ; and are the ones that usually cause asthma or aggravate it severely. The Clair air purifier however operates by attracting polarized contaminants in the air to its synthetic resin film, or in short the e2f filter. 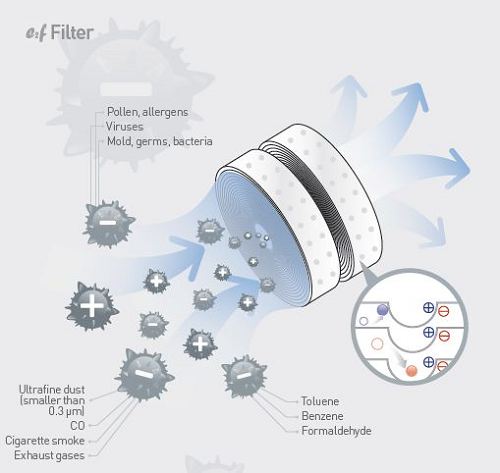 This e2f filter, unlike the HEPA filters, can filter out contaminants in the air of the order of 0.1µ, and this is where the e2f filter beats the HEPA filters by miles and yards. Most of the air purifiers readily available in the market are the ones that are heavy on people’s wallets and tend to consume electricity on the higher end. Clair air purifier is a best fit for you if you want to breathe clean air without the worry of raising your monthly electricity bills. Both the models coming from Clair consume minimal power ranging from as low as 1.2 Watts to a maximum of 5.28 Watts and that won’t be pretty heavy on your monthly electricity bill even if left on for the entire day. Go Clair and say yes to 24/7 of uninterrupted influx of clean and healthy air. One thing that is particularly going to catch the attention of consumers much oriented towards the design aspects is the way the Clair air purifiers are built. The design is simple outstanding and won’t be intrusive in any home setting, easily blending with any environment. The device itself is sturdy and its elegant design completes the air purifier on a pleasant note. 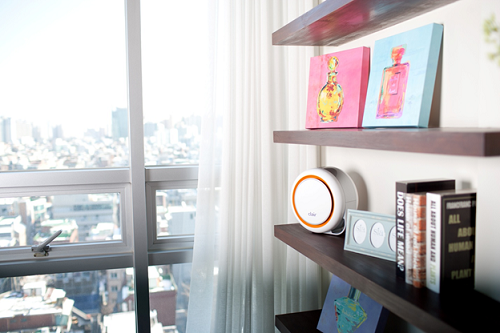 Place the air purifier anywhere in your house and watch it add beauty to the surroundings instead of seeming to be intrusive. Another thing that people despise about air purifiers is the unbearable amount of noise emissions as time wears it out. Clair air purifiers come with whisper-quiet operation, making you forget that the purifier is even on! One of the issues with air purifiers is with a heavy influx of pollutants, the filters need to be cleaned once in every two weeks and it is one of the biggest drawbacks of these devices. But Clair air purifiers have been designed with the maintenance work of the consumer in mind. This device requires the least maintenance of all air purifiers. The e2f filter lasts for over 18 months without the need for replacement, so it is pretty economical and requires less maintenance efforts from your end. This is possibly the best home air purifier out there that completes the 21st century home. With all its technological innovations, aesthetic build and a keen outlook on making it worthy of the consumers time and money, Clair deserves all applauds for its out-of-the-box innovative air purifier for the modern age.